← Screenbums Top Trailers of the week! With a new 50th anniversary James Bond retrospective set to open at The Barbican in London, The Observer picks its Top 10 Favorite Bond Outfits over the years. 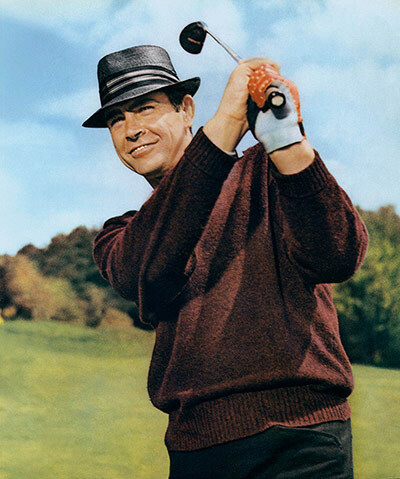 “Bond on the links (1964) Bond is a gentleman sportsman and Sean Connery looked the part in Goldfinger, taking on the eponymous villain in a round of golf. Connery sports a magnificent wine-coloured V-neck, with the yellow Slazenger panther logo to the fore, much like a young Seve Ballesteros. I like the light grey long-sleeve polo underneath and the grey straw trilby with white and red striped hat ribbon is, of course, a touch of genius.The golf scene introduced another classic outfit: that worn by Goldfinger’s caddy Oddjob, complete with a deadly hat. This entry was posted in Animation, Box Office Tallies, Film News, Guy Cinema, James Bond and tagged :Vampire Hunter, Abraham Lincoln, Brave, James Bond, Madagascar 3, Pixar, Sean Connery, Seeking a Friend for the End of the World, Weekend Box Office. Bookmark the permalink.